From the parking area, visitors have two options. 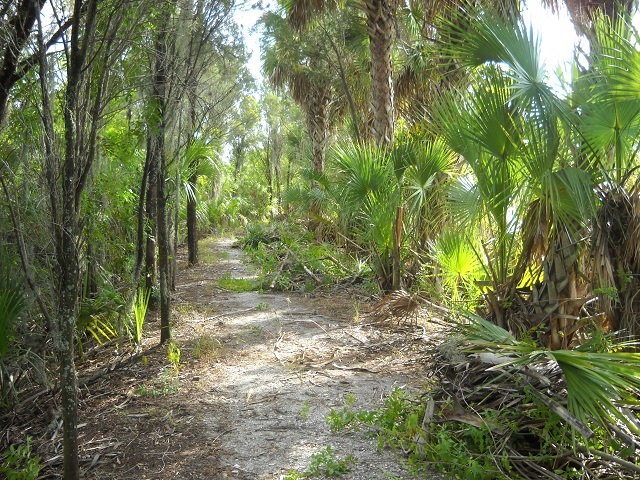 The first is a short nature trail which leads to a boardwalk, where you will journey through the mangroves to the mudflats of McKay Bay. The second option is to take the paved multi-use trail which winds southward through the park; this trail circles the southern tip of the peninsula before heading west back to 34th St. Shorebirding can be difficult but rewarding at this site (a spotting scope is recommended); search from either the observation deck/education pavilion on the east side of the park, or the viewing station on the west side at the end of 34th St. American Avocet, Lesser Yellowlegs, Stilt Sandpiper, Red Knot and Black-necked Stilt are possibilities. Bonaparte’s Gull, Black Tern and Gull-billed Tern have all been recorded. Walk or bike the paved trail to check a series of freshwater ponds complete with winter ducks including Greater Scaup, Northern Pintail, Canvasback and Ruddy Duck. Wood Stork, Roseate Spoonbill and other waterbirds are present year round. Migration brings songbirds such as Blackpoll Warbler, Rose-breasted Grosbeak, Northern Waterthrush, Yellow-throated Warbler and Swainson’s Thrush.